Nottinghamshire skipper Steven Mullaney was full of praise for off-spinner Matthew Carter at the end of the leaders’ opening day of their County Championship Division One match at Somerset. Matt Renshaw’s third Championship century in eight innings was the highlight for Somerset, but the Aussie left-hander — who hit 106 off 171 balls, with 12 fours and two sixes — was a third victim for off-spinner Matthew Carter. Carter was the most successful Notts bowler with four for 81 as Somerset closed on 307 for seven and Luke Fletcher bowled better than his figures of one for 39 suggested. 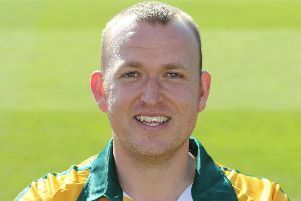 Seamer Matt Milnes claimed a wicket on his Championship debut. Mullaney said: “By the end it was a pretty even day. Eight wickets would have been ideal for us, but we would have settled for seven at the start of play because it is a very good pitch. “I think it will turn, but 307 for seven is about a par score for them. We had a period either side of tea when we could have been a bit tighter, but we bowled well for long periods. Renshaw has scored 411 Championship runs for Somerset at an average of 58.7, making his early departure due to an Australia A tour call-up in August all the more galling for the county. The 22-year-old marked his last home appearance with an important knock. He and Eddie Byrom faced some testing opening overs, particularly from Fletcher, whose initial eight-over spell saw him concede only 11 runs. A half-century stand for the first wicket took 21.3 overs and in the 24th, with the total on 62, Byrom was lbw for 14 pushing forward to Steven Mullaney. By lunch Somerset had progressed to 80 for one, with Renshaw having brought up a 77-ball 50. Notts struck again with the total on 117 when George Bartlett, on 29, edged Carter to slip where Ross Taylor took a low catch. James Hildreth’s fine start to the season was interrupted when, having made only a single, he edged a back-foot defensive shot off Carter to give Taylor another catch. Renshaw went to three figures off 165 balls with a nick through the slips off Mullaney, not the first bit of fortune he had enjoyed. It followed scores of 101 not out against Worcestershire and 112 against Yorkshire in the opening two Championship games. He won’t have been happy with the manner of his dismissal, bowled trying to launch Carter back over his head with the total on 176. Carter likes playing at Taunton. He marked his Notts debut at the ground with match figures of 10 for 195 in 2015. Abell and Davies saw Somerset to tea at 211 for four and the skipper brought up a 117-ball half-century in the final session before falling to the second new ball, caught at first slip by Riki Wessels off Fletcher. At 258 for five, the home side could not feel comfortable. It became 288 for six when Lewis Gregory aimed a slog sweep at Carter, with his side needing a solid finish to the day, and was bowled off a glove for 16. Notts capitalised on that mistake, 23-year-old Milne bowling Roelof van der Merwe for a duck. Davies went to a composed 107-ball fifty, with five fours, and Dom Bess, promoted above Craig Overton in the order following his impressive batting displays for England, was with him at the close.